Appetisers, entrees and desserts can be fired up too. THE culinary team in Villa Danieli Restaurant are out to prove you can cook more than just pizza in a wood-fired oven. The Italian restaurant, located on the fifth level of the Sheraton Imperial Kuala Lumpur Hotel, previously followed tradition by using its large wood-fired oven exclusively for baking pizzas until executive sous chef Kamaruddin Adnin had a brainwave. 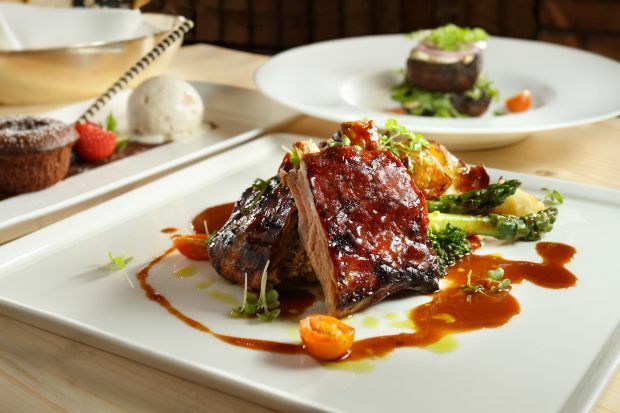 Working with his team of trained chefs, Kamaruddin developed a rustic Italian menu cooked entirely in the wood-fired oven, which includes appetisers, entrees and desserts. The wood-fired oven differs from the electric or gas ovens in that it is only “fired up” once. Chefs can then cook a variety of dishes at the varying temperatures of the oven as it cools down slowly over several hours. “We have to do everything instinctively as there is no way to tell the exact temperature in the oven” said Kamaruddin. The restaurant’s new menu includes a set menu as well as the opportunity for guests to create their own perfect meal from a choice of meat bases, sides and sauces. Those who wish to err on the side of tradition can choose from an extensive menu of starters, mains and desserts. parmigiana and a wild mushroom tart. I opted for the Cheesy Portobello Mushroom, which was a portobello mushroom stuffed with herbs and goat’s cheese. Mushroom and goat’s cheese is already one of my favourite culinary combinations, so it was inevitable that I would enjoy this starter. The portobello mushroom was cooked perfectly with the right amount of seasoning and balanced well with the herb infused goat’s cheese. The main course menu boasts a large variety of options, including beef ragout lasagna, a traditional Italian sandwich and king prawns with mustard mashed potato. We sampled three of the most popular mains, including what Kamaruddin refers to as his signature dish – lamb ribs served with Coca-Cola BBQ sauce. It is easy to understand why Kamaruddin is so proud of this dish – the lamb practically falls off the bone after marinating for hours before being braised and baked. The Coca-Cola BBQ sauce, which sounds extremely dubious, is incredible. The smokey hickory taste expected on a good set of ribs is balanced with the slight sweetness of the Coca-Cola, creating an old-fashioned sauce with a delicate, sophisticated twist. The ribs are served with steak fries and perfectly steamed broccolini, which complements this rich and hearty dish. The other mains included a baked tagliatelle with red and yellow peppers, red onions and mushrooms cooked in an Alfredo sauce. This dish was the weakest of the three mains I sampled; although the pasta was cooked well, there wasn’t quite enough sauce or vegetables, making the dish slightly dry. It was a shame as the flavours were there, I just could have done with more of them. 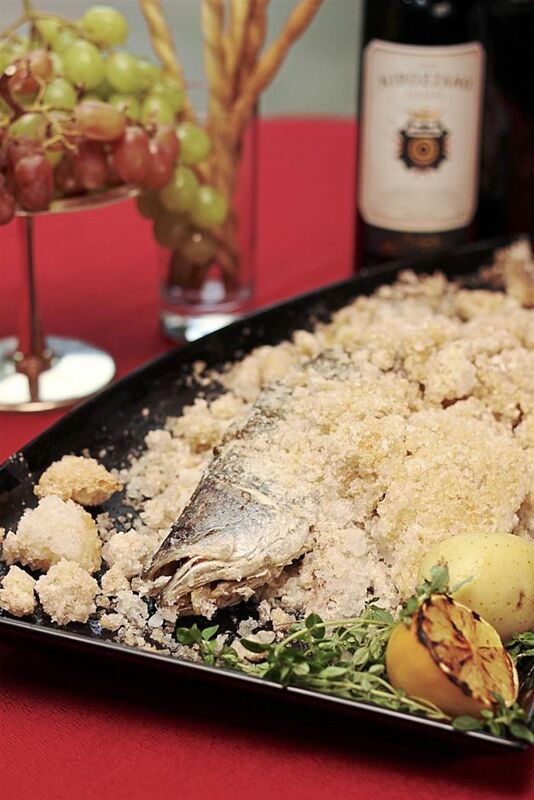 A specialty main dish from the Villa Danieli’s new wood-fired menu: Salt-crusted whole sea bass with steamed fennel and potato and lemon butter sauce. I also sampled the salt-crusted sea bass, which was served whole and deboned at the table. This is always enjoyable to watch as a customer, the whole sea bass looked fantastic and deboning an entire fish is quite a skill. The sea bass was served with steamed fennel and potato and a lemon butter sauce. The fish itself was delicious, cooked perfectly and extremely fresh, but it was even further complemented by the lemon butter sauce, which was rich in flavour but still delicate and subtle. Although the lamb ribs are the chef’s signature, this was the knockout dish for me. The mains were followed by a rich dessert, a chocolate lava cake served with walnut ice cream. Of course the ice cream was not wood-fired, but it was incredible to see the versatility chef Kamaruddin achieved with one wood-fired oven. As a chocolate lover, I found this dessert wonderful. Cut open the small chocolate cake and out pours a river of rich dark chocolate fondant. The walnut ice cream was delicous too. The other desserts included an apple strudel with berries coulis and pear tartin served with a ricotta mousse. The new menu is sure to be a hit with the already loyal customers, who still can expect to have their craving for hearty, traditional Italian food fulfilled. Others should also give this place a try, the wood-fired oven menu is a culinary experiment that deserves to be given a chance.